Penelitian - An ancient, dolphin-like marine reptile resembles its distant relative in more than appearance, according to an international team of researchers that includes scientists from North Carolina State University and Sweden's Lund University. 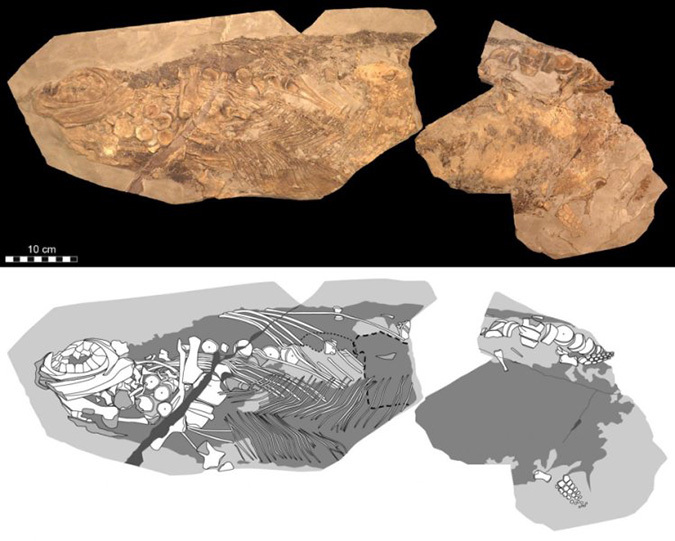 Molecular and microstructural analysis of a Stenopterygius ichthyosaur from the Jurassic (180 million years ago) reveals that these animals were most likely warm-blooded, had insulating blubber and used their coloration as camouflage from predators. "Ichthyosaurs are interesting because they have many traits in common with dolphins, but are not at all closely related to those sea-dwelling mammals," says Mary Schweitzer of the North Carolina Museum of Natural Sciences and Lund University. "We aren't exactly sure of their biology either. They have many features in common with living marine reptiles like sea turtles, but we know from the fossil record that they gave live birth, which is associated with warm-bloodedness. This study reveals some of those biological mysteries," Schweitzer says. "Both the body outline and remnants of internal organs are clearly visible. Remarkably, the fossil is so well-preserved that it is possible to observe individual cellular layers within its skin," says Lindgren. Schweitzer and NC State research assistant Wenxia Zheng extracted soft tissues from the samples and performed multiple, high-resolution immunohistochemical analyses. "We developed a panel of antibodies that we applied to all of the samples, and saw differential binding, meaning the antibodies for a particular protein -- like keratin or hemoglobin -- only bound to particular areas," Schweitzer says. "This demonstrates the specificity of these antibodies and is strong evidence that different proteins persist in different tissues. You wouldn't expect to find keratin in the liver, for example, but you would expect hemoglobin. And that's what we saw in the responses of these samples to different antibodies and other chemical tools," says Schweitzer. "This is the first direct, chemical evidence for warm-bloodedness in an ichthyosaur, because blubber is a feature of warm-blooded animals," Schweitzer says. "Both morphologically and chemically, we found that although Stenopterygius would be loosely considered 'reptiles,' they lost the scaly skin associated with these animals -- just as the modern leatherback sea turtle has. Losing the scales reduces drag and increases maneuverability underwater," Schweitzer says. "This animal's preservation is unusual, especially for a marine environment -- but then, the Holzmaden formation is known for its exceptional preservation. This specimen has given us more evidence that these tissues and molecules can preserve for extremely long periods, and that soft tissue analysis can shed light on evolutionary patterns, relationships, and how ancient animals functioned in their environment."